A lot of landscape photographers are interested in focus stacking — combining multiple images of the same scene, each focused at different distances, into a single photo. This is a useful tool to have at your disposal, since it lets you take pictures in more situations than you otherwise could. For example, if elements of your photo are very close to your camera, focus stacking may be the only way to get a sharp shot. Although I don’t use this technique for every photo, it’s something that I keep in mind when I’m taking pictures in challenging conditions. This article gives an overview of focus stacking for landscape photography, including step-by-step instructions on how to focus stack photos in Photoshop. All of these tips are also relevant for other types of photography, not just landscapes. 1) What Is Focus Stacking? Focus stacking is an interesting development of digital photography, and, more specifically, digital post-processing. Focus stacking lets you take several photos of a landscape, focused at different points, and combine them together into the sharpest possible image. For example, you may take three photos at a particular scene: one focused on the foreground, another on the middle-ground, and a third on the background. Then, you can take the best parts of each photo and combine them into a fully-focused image. You can focus stack with any lens and camera, but you need to have the right post-processing software to combine the photos together. I use Photoshop, since that’s what I already own, but there are better programs out there if you do a lot of focus stacking — Helicon Focus and Zerene Stacker being the two main products. However, if you only do occasional focus stacking, Photoshop’s tools should be fine. There are two main reasons why you might want to focus stack a landscape photo. First, you could be photographing a landscape that has too much depth. In other words, some parts of the scene are too close to your camera, and they’re out-of-focus if you shoot just a single photo. This can happen if your foreground is very close to your camera — there’s just no way to capture a focused foreground and background in one shot (even at small apertures like f/16). You’ll also run into sharpness problems when you use telephoto lenses for landscape photography. Because they have such a thin depth of field, telephoto lenses will cause some blurriness in all but the most distant landscapes. Again, even an aperture of f/16 may not give you enough depth of field. For me, that’s the most common time that I use focus stacking — when there’s no other way to get enough depth of field. In fact, I shoot most of my focus stacks at f/16, since it means that I don’t have to take as many photos (more on that later). However, there’s also a second reason why some photographers focus stack, and it’s equally valid. Because all lenses have a sweet spot, there will be an aperture that gives you the sharpest possible photo. For a lot of lenses, this sweet spot will be somewhere from f/4 to f/8. Unfortunately, those apertures don’t always give you enough depth of field, so you have to compromise. Or not — that’s the other reason to use focus stacking. If you want the absolute highest image quality of a given landscape, you can use your lens’s sharpest aperture and stack together as many shots as you need. The downside, of course, is that you need to take several photos per scene to capture all the depth of field. In the end, you should only focus stack if you require more detail than the camera can capture in a single photo. You might create huge prints, do a lot of cropping, or work with landscapes that have an unusually large depth of field. Regardless, focus stacking helps you get the last little bit of image quality that you can. 3) When Can You Use Focus Stacking? Of course, nothing is a free ride. On one hand, compared to a single photo, focus stacking takes up more time and memory card space. Plus, not all landscapes even work for focus stacking. For example, think about a wave rolling into shore. It’s not a problem to take a single photo, but focus stacking is essentially impossible — the wave will move too much from frame to frame. This is true in many landscapes with fast-moving subjects. The more quickly a scene changes, the harder it is to focus stack. If the landscape isn’t moving too much, though, you can focus stack most of the time. Of course, this is only true if you’re willing to go through the effort of capturing multiple photos at once. The more often that you focus stack, the longer you need to spend working on every shot you take — both in the field and in post-processing. If you use focus stacking 100% of the time, you’ll run out of space on your memory card much faster than usual. That said, if you have to use focus stacking, it’s a great tool. Don’t avoid it just because it takes time; in the end, it’s worth the effort for certain scenes. So, how do you focus stack? That’s covered in the next section. Focus stacking isn’t hard, but it definitely requires more effort than when you take single photos. To start, you need to employ best practices in the field. What does this mean? Quite simply, you have to take photos in a way that your stacking software can recognize easily. First, you should use a tripod. Although it’s possible to shoot handheld focus stacks, it will increase the likelihood of difficulties in post-processing. Second, make sure that you don’t change the focus too much from shot to shot. For example, if you only take two photos — one focused on the foreground, and one on the background — the middle of your photo could be blurry! 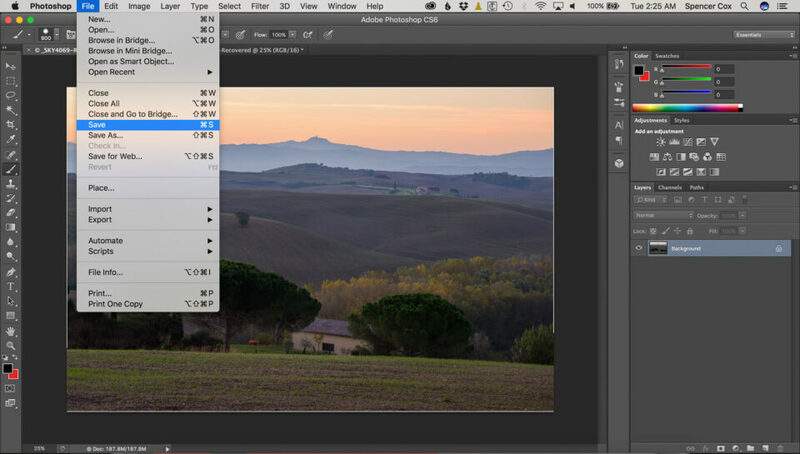 Even if your post-processing software still blends the shots together, the final image won’t look very good. When you’re in the field, it’s best to focus on the exact spot in the prior image where sharpness first starts to decrease. You might need to zoom in on live-view in order to do this properly. By doing this, you avoid an unnatural-looking final result. 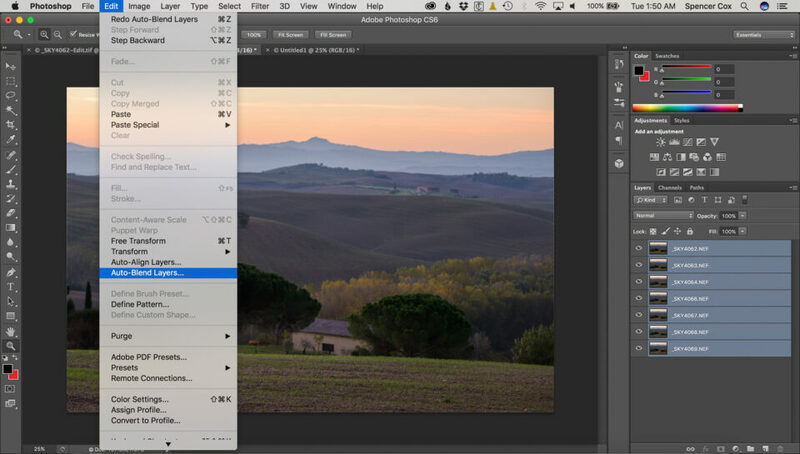 Before you open the photos in Photoshop, you need to make sure that they are ready to merge. 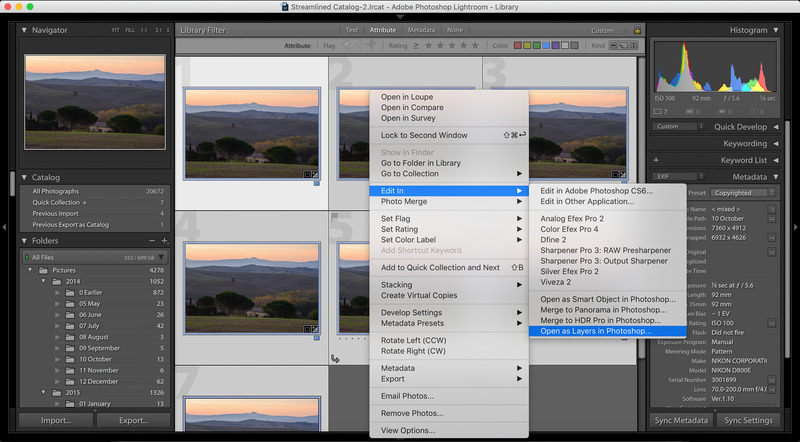 Specifically, ensure that the brightness of all your photos is the same — otherwise, they won’t merge properly. Normally, this won’t be a problem, but you might notice a brightness difference if the light was changing quickly from shot to shot. This is the unedited version of the final focus stack. You can see how much sharper it is than the prior photo — click on the two images if you want to compare them larger. Finally, once you’re done cropping, just clean up the image and edit it however you want! There’s no wrong way to proceed from here. You’ve already created a focus-stacked image. Although focus stacking isn’t something you should do all the time, it’s an important tool to have at your disposal. Sometimes, you may use a telephoto lens and have difficulties getting everything in-focus. Or, you could have a landscape that stretches so far that even f/16 doesn’t have enough depth of field. Finally, if you’re interested in nothing but the top sharpness, you might focus stack a landscape simply to use your lens’s sharpest aperture (like f/5.6 or f/8) rather than a smaller aperture which has diffraction. There is no right or wrong reason to focus stack, but be aware that you can take this technique to levels that might not be worth the effort. When I first learned about this focus stacking, I tried to use it on every landscape that I shot, simply to get the sharpest photos. Unfortunately, this meant that each photo took five times longer to capture! I ended up with sharp photos, but I didn’t get as much variety in my shots, and my work suffered as a result. Now, I’m more likely to use f/16 than to focus stack at f/5.6. If focus stacking works well for your personal style, though, that’s great — don’t let me discourage you. It just isn’t the case for everyone. Hopefully, this helped provide a good platform for you to start focus stacking your own shots! If you haven’t tried it before, give it a go. For certain difficult landscapes, focus stacking is an incredible tool. Thanks for the article, lately I started focus stacking especially for macro but noticed the work of very talented photographers like alex noriega and alex mody . I noticed that they sometimes focus stack with a picture of the sky taken at a different hour or couples minutes later sometimes to get the stars the sun well exposed or ( sunstar) or the hue in the sky from a different time of the day . Im wondering how they do that ? Same can be said about HDR or sometimes it is a mix between both focus stacking + HDR .. . But since the clouds , the sun or the stars are moving I guess one really need to put the sky he wants with a layer and remove all parts of the ” other” sky shots? .. Does this make sense ? Usually, those shots aren’t focus stacks – they’re just a blend of photos taken at different times of day. If you keep your tripod in one spot over a period of time, you can load the resulting photos into Photoshop and blend them manually or with luminosity masks. No need to go through the process in this article. Thanks a lot for the article that make me clear for this technique. Great article! My one suggestion would be to add instructions for those of us that are using Photoshop CC. Is the process not the same? I don’t believe that Adobe changed anything about focus stacking from CS6 to CC. However, I don’t have CC, so I can’t say for sure. Focus stacking is also BIG in macro shooting. It is also helpful in quite a few other fronts. Since cameras can facilitate taking a series of photos automatically varying (bracketing) AE & flash, AE only, White Balance, and Active D-Lighting, at least on Nikon; why don’t cameras have a way to bracket focus–say with an option of 3,5,7, or 11 brackets? I guess it would also have to have an option of how much each bracket would vary. I know this would be tough, and not useful in all situations; but it would also be handy in a lot of situations. Something like that would be nice, although my guess is that it won’t be implemented. There are simply too many variables – lenses have sample variation, and they even change where they focus depending upon the temperature. I could see Nikon introducing a system where you point it at the closest and farthest elements of an image, and the camera does the rest, but even that would be tough. If they can do it, though, I certainly wouldn’t complain! As someone who focus stacks landscapes, ie not macros; I also ask this question a lot, ie why don’t manufacturers include a focus stacking option, like they do for exposure stacking. One complexity is that the lens needs to be controlled, ie moved, whereas in exposure stacking the ‘only’ thing that is usually changed is the shutter time. I think we will see in-camera apps that allow focus stacking, as more camera makers go over to ‘open cameras’, ie where we can add in additional functionality. Until then, Canon users (and I’m one) are lucky enough to have Magic Lantern. I have written in-camera landscape stacking scripts that run fully in-camera. The focus stacking part, which can be run with exposure stacking as well, accounts for diffraction and ensures each stack overlaps, ie so there are no focus variations in post. Anyone (Canon user that is) interested in trying out my scrips, please feel free to contact me and read my blog at photography.grayheron.net. Olympus do have this feature in their later OM-D models – E-M1 and E-M5mii for sure; PEN F as well I think. There are a couple of the ‘pro’ lenses which actually allow the whole process to be done in camera too. (I’m sure this could be done with any lens but I think they are keeping it as a feature to encourage the purchase of that particular line of lenses). In conjunction with their ‘high res’ mode of capture, one could achieve results on par with medium-format digital. I’ve yet to attempt both of these features in tandem as it might be a little mind-boggling in complexity for a simpleton like myself, but for something like macro photography as well (landscapes on a miniature scale) it could well prove worth the effort. Thanks Spencer, this article has motivated me to have a go at stacking, well explained, now I have just got to get on with it. Effective display to illustrate the principal. Great photo as well, cheers. I wish I would have it some months back. Could have far more landscapes from scenic God’s own country (Kerala, India). Will use this in next ventures for sure. Thanks a lot for this. The steps in photoshop CC are identical to what Spencer laid out in the article. However in each upgrade the focus stacking algorithms have become increasingly polished, leaving fewer artifacts. Even so you can not always depend on the process working as you wish. Particularly vexing are intervening branches which lead to little fuzzy zones next to them. While tremendously useful for macro work, wind is even more of an enemy than before. Now you need to lay down multiple images crisply instead of just one. Zerene and Helicon offer additional tools for editing results and easily modify artifacts. Spencer, good explanation of the process of focus stacking. I suppose what would be interesting is a comparison with the original at F11 or F16 too, F5.6 is a pretty strange aperture for a landscape picture. I would say the picture you have provided is not a good example, however. For me, focus stacking should be used when the picture is already an extreme view that the human eye cannot usually take in. For example, in Macro photos, using FS allows all of a subject to be in focus, which would not normally be possible if you actually looked at something really closely. Similarly, if you have a very wide-angle landscape photo, with a foreground element that is also of interest, FS allows you to render all elements sharply which you would never be able to do with the human eye. In those examples, because the basic narrative is to demonstrate an extreme image, it is impressive to see the sharpness across the frame. On the other hand, in the example you have provided, the angle of view is fairly ‘normal’ (92mm) and the scene has no key element as far as I can tell, it is the whole view that is interesting. Therefore, having a degree of natural softness in the foreground and background is fine. In the focus stacked version, the eye flicks between the nearby house, or the far off mountain-top in an effort to decide which is the element of interest, and that uncertainty detracts from the appreciation of the overall scene. Technically, it may be interesting to be able to make everything sharp in a photo, but that does not always aid the appreciation of the image being portrayed. 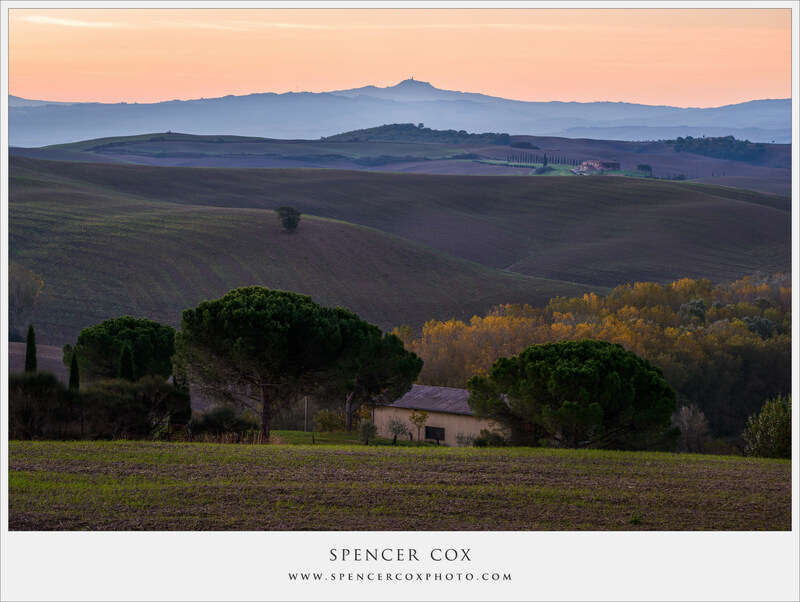 For me, your picture is an appreciation of the textures and colours of evening light, not an inspection of any of the specific elements in the scene, per se. I’m basing this on a desktop viewing of course. In the case of a large enlargement for gallery display, your increased sharpness may certainly help if the softness in the original appears too much, or if one of the elements in the picture is something you are aiming to highlight. That is true. I took a version at f/16, and it obviously was better than the f/5.6 version, but still unsharp. You are right that many people will use this method with wide-angle lenses, not telephotos. Of course, if you want all of a telephoto landscape to appear sharp, it’s certainly something you should keep in mind! I find that I use it more with telephotos than wide-angles, actually, because they have less depth of field — but I know this isn’t the most common way to do it. As for the artistic side of things, you make a great point. Sometimes, a landscape is better when it is intentionally unsharp (slightly) in the background or closest foreground. You’re never obligated to use focus stacking, even if your landscape extends beyond your depth of field. Thanks for the reply. I certainly see the benefit of FS, especially if a large print is the likely output. Amazing how much the detail in the distant trees is improved. Another thing I just noticed was that the original appears to be focused on the foreground grass bank. Even at F5.6, it usually would be better to focus further into the shot near the hyperfocal distance, which should be around the lone tree on the second hill. That would probably put the grass slightly out of focus, but most of the rest of the shot would have been sharp, if not quite as sharp as the FS. Yes, but, here, I was just trying to take one of the seven images that I ultimately used for the focus stack and use it as an example. If I were trying to create this photo in a single shot, I would have used f/16 at the hyperfocal distance. The photoshop process outlined above continues unchanged, even through the recent CC 2017. I have a question on this. Does focus breathing become an issue with focus stacking. The change in focus can be very small but if the lens is exhibits a considerable amount of breathing with some focal lengths and focal distances would this render the lens incompatible with the process? It does become a problem, but not a huge one. No matter how much focus breathing your lens exhibits, it’s still possible to create a successful focus stack. However, if your lens has a huge focus breathing problem, you’ll need to be more careful from shot to shot — you may need to change focus more slowly than with a non-breathing lens. This means you’ll probably have to take more total photos if you want to play it safe. The important point is that the “Edit > Align” step in Photoshop will magnify or shrink photos with slightly different fields of view, so it isn’t much of a problem. Software can correct for focus breathing fairly easily. One last thing: if your lens does exhibit focus breathing, the final focus stack will have blurry edges all around it. That’s why the last step in section 5 above tells you to crop out the blurry edges in Lightroom. Hi Spencer- I don’t have Photoshop but I do have Elements 14… do you know if I can focus stack using Elements? I believe that GIMP (an open-source Photoshop alternative) also has plugins that can do focus stacking, and they’d be free. You’ll have to jump through a few hoops to get either of these solutions to work. If you’re planning to do a lot of stacking, you should think about Zerene or Helicon instead. Thanks for the arctile, it’s pretty interesting. However, I had a strange problem with this technique. When I focused on different planes, objects of the focused plane grew in size i.e. occupied more space in the frame. So Fotoshop failed to correctly align the frames later. The closest focus plane was about 2 meters and the fartherst was about 1 km, the lens – nikkor 70-200 f/4. Not sure what was the cause of the problem. I use Photoshop and also others ‘stackers’, such as Zerene etc. All manage to align and correct the frames. 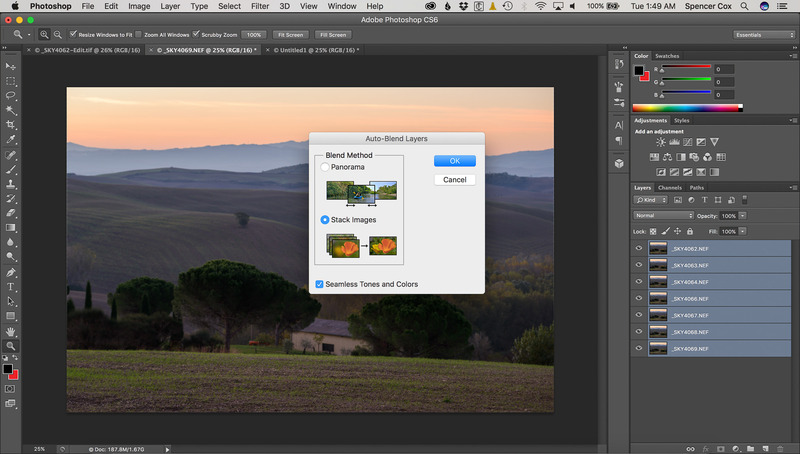 Have you tried non photoshop stackers? It’s not about software, it’s about taking pictures. I’ve checked the frames again, things are much worse than I described in the initial comment. It looks similar as if I zoomed in while I didn’t. Focus length was 70. Sorry, I don’t understand your comments. It is normal for the scene to change slightly and it will be more noticeable at longer focal lengths. The auto align function in PS should correct as will any good piece of stacking software. Didn’t know that this is normal, thought that I do something wrong. Thanks. Please don’t hesitate to ask for any help or advise as you explore focus stacking. 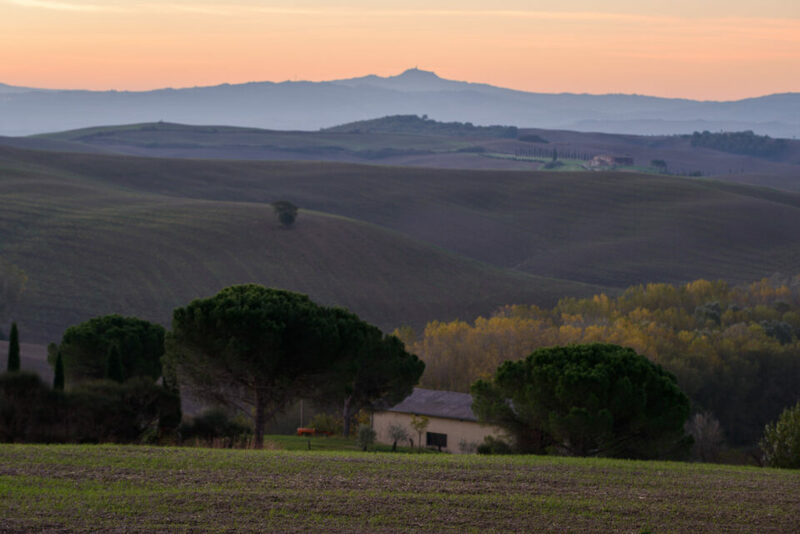 Is this Tuscany, isn’t it? Very interesting article. This was something I was not familiar with, but it looks like something I could make some good use of. Thank you. This is so much to take in for a newbie! thanks for the clear explanation, Im fascinated, and the finished photo is beautiful. I’m going to assume that to ensure the least amount of variation we need to avoid Auto WB, focus manually and maintain the same exposure? Or, can overexposing the foreground a tad for more detail be beneficial since the stack process from LR to PS doesn’t include any histogram edits? How much latitude is there at this point if you want to open up an area that is in shadow? 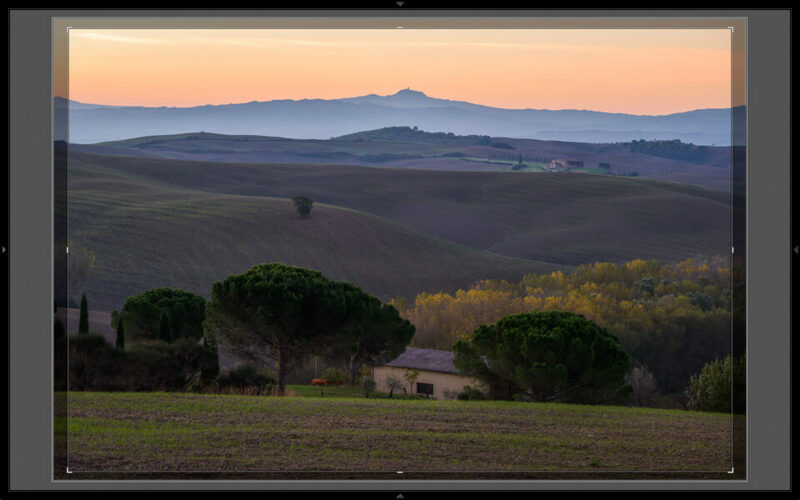 Seems it would be advantagous prior to dealing with a composite image in LR, or PS for that matter. Or, does the image remain a RAW file throughout all this editing and afford you the opp to edit at that stage? Which approach makes more sense? Excellent primer on the subject – I will be using this soon. You are right that if focus (or exposure) stacking, you should be at a fixed WB and shooting RAW. The challenge in landscape focus bracketing, unlike macro where the near and far depths of field are equal and minuscule: in landscape focus bracketing you need to account for the varying DoFs. If you are not a Canon shooter, you will need to use an app to calculate the number of brackets and keep your fingers crossed, unless your lens provides focus distance feedback, ie very difficult to read the lens markings. I am using PS CS3, so can’t use the newer stack feature – the photomerge doesn’t work for stacked images. Instead, I got Enfuse and it does fine. For a test, I just chose successive focus points – 6 of them – to test a landscape image in my front yard. May not have done enough frames as the closer 2 frames would not ‘come in’ as well as the infinity frames to the finished stacked image. 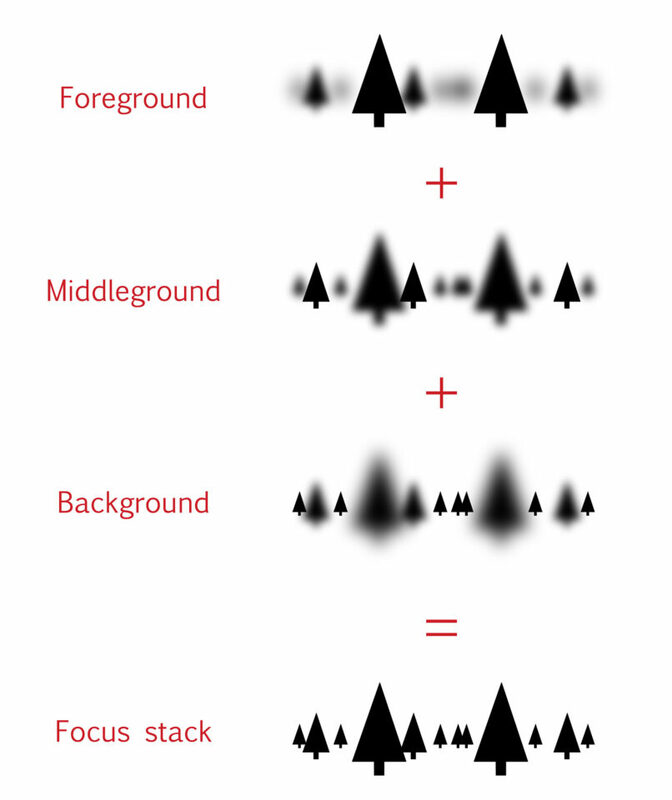 One quick way of estimating where to focus in a landscape, is to choose a healthy focus criterion, i.e. a defocus blur (C) of say 15 microns (diffraction blur will add to this of course, so don’t go too narrow in your aperature, say, F/8 or F/12). Estimate the hyperfocal distance (H) from ((focal_length)^2)/(C*Aperature_Number). Now simply focus at H/(2n-1), where n is the number of images you wish to take to cover you from infinity to a near depth of field distance at H/(2n). I would also take one at 2H so that my infinity blur was C/2. The above bracketing strategy is about the best you can do. The only downside is know where to focus in tne scene. If your camera reports duistance in LV, you OK; like Magic Lantern does. Just to be clear you focus at H/(2n-1) for n = 1 to your last image, i.e. H, H/3, H/5….H/(2n-1). The number of images is easy to estimate from near dof of nth image is at H/(2n), i.e. number of images to cover from X to infinity is about H/(2X). The Nikon D850 does focus shift. I takes up to 300 images with one click of the shutter. These images are stacked in PSCC to give one image with everything in focus to infinity. Like many, I eagerly wait for camera manufactures to give us the camera we need, eg RAW histograms, auto ETTR, auto exposure bracketing and focus stacking. Until then, at least the Canon community has all this thanks to Magic Lantern. Agreed! You would think the fact of Magic Lantern’s popularity would spurn camera manufacturers to include some of those features standard… but apparently not. That’s certainly a selling point for Canon cameras! Excellent article Spencer, well explained, I presume u focus in live view using manual focus and zooming in to check your focus? Thank you, Gerard, and my apologies for the late response! Yes, that’s exactly what I do – incrementally manual focus the lens from shot to shot, zooming in on live view to magnify things. You certainly can use autofocus if you would like. It’s usually quite accurate in live view. The issue is that you’ll want to magnify things either way so that you can tell exactly where the focus starts to fall off too suddenly, and, once you do that, manual focus is just as fast. It’s also smoother; autofocus can jump in and out before focusing properly, making it simply more challenging to remember where it was focused for the prior image.